A chordoma is a rare type of bone cancer that develops from the notochord. Chordomas can be found in any part of the spine and around half occur at the bottom of the spine. About 2 in 5 (34-40%) occur at the base of the skull or in the bones running down the middle of the face. Chordomas tend to be slow growing and don’t often spread to other parts of the body. If they do spread, the most commonly affected places are the lungs, liver, nearby lymph nodes, bone and skin. Chordomas can present at any age, but mainly affect people aged 40-60. Fewer than 1 in 20 of all chordomas occur in people under the age of 20 and childhood chordomas are rare. The exact cause of chordomas is unknown. The most common symptoms of skull base chordomas include headaches, double vision, facial pain, changes in hearing, difficulty swallowing and/or a feeling of dizziness (vertigo). It is important to remember, all of these symptoms are common to many other conditions and further tests and investigations is needed before an accurate diagnosis can be made. For diagnosis, a CT or MRI scan is used to find the exact position and size of the tumor and in many cases a biopsy is obtained to ensure an accurate diagnosis is made. The treatment for a chordoma depends on a number of things, including the patient’s general health and the size and position of the tumor. Where possible, surgery is used to remove the tumor and nearby tissue that might contain cancer cells. If it is too difficult to remove the chordoma completely, radiation therapy and chemotherapy may be considered after surgery to destroy any remaining tumor cells. To date, chemotherapy has not been shown to be very effective in treating chordomas but if surgery isn’t possible, it may be used in conjunction with radiation therapy. After treatment is completed, the patient is followed for several years post surgery with periodic imaging to check for recurrence. 47-year-old male who initially presented after noticing some double vision while driving (diplopia). A CT and MRI scan demonstrated a lesion in his clivus. Imaging was consistent with a chordoma. Chordomas are tumors along the skull base and surgery is often performed by both an otolaryngologist and a neurosurgeon working together. This was the case in this situation, were the patient was taken for a completely endoscopic resection of the tumor through the nose and sinuses. Following surgery he did very well. He was in the hospital for 3 days and his immediate postoperative MRI demonstrated no further tumor. 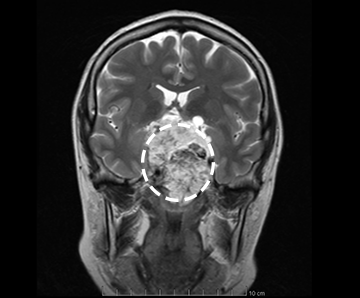 After this area healed he underwent proton beam radiation. He has been three years out from surgery and does very well with no further double vision and no evidence of any tumor recurrence. This is a 47-year-old female who initially presented with some imbalance while walking and decreased peripheral vision, particularly on the right for a period of one year that has gradually been worsening. She initially went to an ophthalmologist who referred her to another specialist who ordered visual fields tests and identified that she had decreased vision in the left eye and prompted an MRI. The MRI demonstrated a large mass involving the sphenoid sinuses and clival area.The imaging was most consistent with a large chordoma. She was taken in for an endoscopic surgical resection by an experienced skull base team consisting of both a neurosurgeon and an otolaryngologist. Pathology confirmed this was a chordoma. Postoperatively the MRI demonstrated a small foci of residual tumor which was removed through an open approach (not through the nose). This resected the entire tumor. Following this she underwent radiation therapy. She is currently 2 years out from surgery and reports that all her visual symptoms and imbalance have resolved. 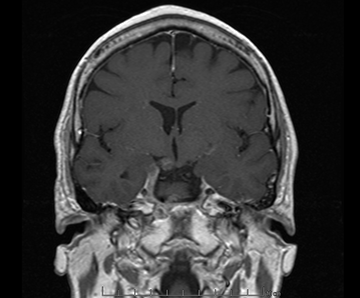 Additionally, she has demonstrated no signs of recurrence on follow up MRIs.